As far as I am aware, many people say that the ‘Super Nintendo Entertainment System’ (or SNES for short) is one of the best consoles ever made. Personally I agree with them. Now granted I never owned a SNES in my younger years as I was born in 1992, one year too late for when the SNES came out. But I have been playing some games for the SNES on the ‘Nintendo Wii’s virtual console and I am enjoying every second of playing them, some I even consider to be my all time favourite games. Today we are going to look at one of the launch titles for the SNES. 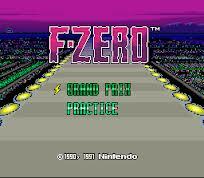 This is my review of ‘F-Zero’. 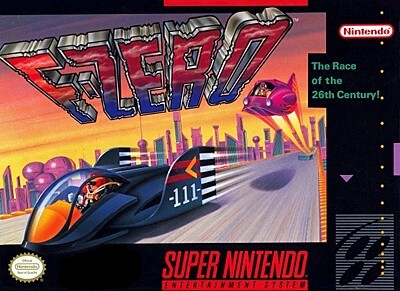 As I said before, ‘F-Zero’ was released as a launch title for the SNES in 1991 along with ‘Gradius 3’, ‘Pilotwings’, ‘Sim City’ and ‘Super Mario World’. The SNES introduced a lot of outstanding qualities for video games that bought a whole ton of popularity for video games. But how well does one of the very first games for one of the greatest consoles of all time stand up to the latest generation of gaming? That’s what we are here to find out so let’s get started. I have nothing to say about the story for this game because there is no story. The only way to know about the story is to have the manuel but if you got this game on the virtual console (like I did) then you have no clue what’s going on. But the game doesn’t present any kind of story to begin with. 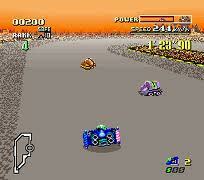 Though from what I can tell, ‘F-Zero’ is a racing tournament that takes place all over the galaxy. 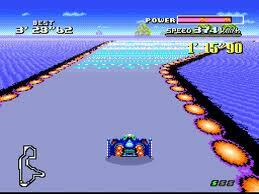 ‘F-Zero’ is a racing game from the third-person perspective. You use the D-Pad to control your car. You use the B button to accelerate, the Y button to brake and the A button to use your super jet which you can use after you finish a lap. You use the L and R buttons to lean your car to the side which is good for turning around corners smoother. 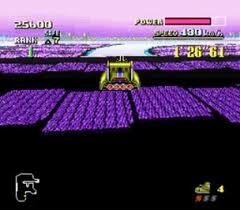 The game’s HUD contains a power bar which contains your life energy, your current speed, the current rank you are in the race, a map of the track and how many lives you have to continue the race and a number of times that you can use the super jet. You pick from one of four cars to play as in the race, each having their own attributes. You can pick to race in one of three circuits, Knight League, Queen League or King League. They each sport their own tracks and challenges. There is also a practice mode where you can race around your favourite tracks all by yourself. Like all racing games. the objective of the game to race around the track a certain number of times, cross the finish line and get the higher ranking than your opponents. You race around the track five times and you have to win without getting your power bar down to zero otherwise you automatically lose the race. Your power bar goes down by touching the orbs on the edges of the tracks, touching mines on the road that look more like dart boards or your car gets automatically destroyed if you go off the track. There are glowing sections along the tracks or usually at the start line which restores your power. The stages in this game are pretty good and linear in structure, but I swear that there are a couple of stages that want you dead. For example, Sand Ocean has too many narrow tracks for my taste and the two Death Wind stages have pretty strong wind currents that can blow you to the edge of the track if you are not careful. However it doesn’t get any worse than White Land 2. I hate this stage because of one major design flaw. There is one big jump that you have to make to get you to the other side and if you fail, you will die thus losing the race. You have to pick up the right amount to speed to get to the other side and you can’t use the super jet until you finish the lap. This is the most garbage and downright unfair design concept I have ever come across in a racing game and it’s because of stages like this that I have never beaten the Queen’s league or the King’s League. I think that the graphics for this game are pretty good. This is one of the first games to introduce revolutionary rotating graphics for a 3D effect and I think it still looks pretty nice for a 16-bit game. The environments can be pretty nice to look at too. The soundtrack is pretty enjoyable. I especially enjoy the tracks for Mute City and Big Blue. The sound effects for this game are also pretty good as you feel like you are actually racing against super fast futuristic vehicles. Despite controlling super fast vehicles, you do feel like you are in control of these vehicles. The physics can be a bit powerful when it comes to other vehicles crashing into you and it can be slippery in certain areas of some tracks, but there should never be a time where you have an unfair advantage because of control. I think it’s pretty obvious at this point but there wasn’t really much I could say about this game. It was really short and there isn’t really much to accomplish or unlock as far as I’m aware. I will say thought that the game lacks re-playability. Once you beat a league, there isn’t really much to do after that and you can only have fun replaying it for so long. So while I don’t think it’s a bad game, I don’t think it’s that fun as a game for the modern generation. Personally there are much better racing games out there.